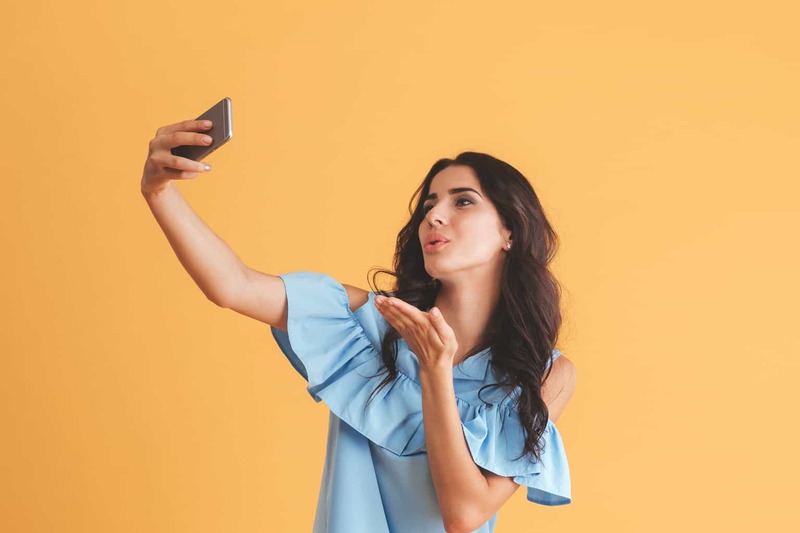 In surveying college students, Donna Freitas found they described selfies as “arrogant, self-absorbed, disgusting, degrading, ridiculous, vapid, useless, selfish, shameless, vain and hedonistic.” We chastise ourselves for self-interest, even while we’re posting. A cycle of self-loathing may follow. So much of the anxiety swirling around social media arises from a crisis of identity. We may be uncertain who we are and whose we are. We take selfies for many reasons, from documenting our lives, to promoting our products, to keeping up with our families. When we scroll through the photos of friends and people we follow on Facebook, Instagram, and Snapchat, we are also searching for something. It might be a search for information, a longing for a partner, a desire to connect with the world beyond our selves. When we are searching for affirmation via our selfies or studying others’ faces and photos, we are often looking for love that rises above romance. Some see our selfies as a convenient and communicative art; others find them utterly appalling. They can be silly or serious, casual or curated. They reflect our moods, our memories, our state of mind. They may be moments that we want to hold on to or replies that we expect will be thrown away. Snapchat made our self-imaging disposable fun. Yet, throughout history, our most enduring self-portraits have arisen from thoughtful reflection and soul searching. They express our creativity and depth. Selfies can express art and soul via our bodies. Adolescents have been offered a license to post without any accompanying ethical framework. Is it fair to blame teens for misusing tools that didn’t exist in our childhood? If I had been given a phone with an ability to take pictures when I was thirteen, I would not have photographed many things to be proud of. What kinds of public mistakes would I have made if emboldened by this new possibility? We are now all engaged in what sociologist Erving Goffman described over fifty years ago as “the arts of impression management.” Thanks to social media, adolescents are often forced to grow up in public at earlier ages and stages. They are embarking upon an ancient challenge, to know thyself, while broadcasting each awkward step along the way. Is it fair to criticize the young for not acting more maturely? We have been quick to condemn and slow to listen (or see). Nowadays, we all assume that we are all available at all times, and we all expect (maybe even demand) an immediate response. Parents can go into a rage or a panic if their teens fail to respond to a text message asking for an update. Relationships may end if we fail to respond to our friends’ online drama in a timely manner. To opt out is often to drop out of that social circle. We may be permanently removed from the group chat. Nobody wants to break a Snapchat streak. To keep up with Snapchat, Instagram, Facebook, and Twitter takes an enormous amount of attention. Responding to so many simultaneous pings can be stressful—perhaps far more stressful than we realized when we handed a thirteen-year-old their first smartphone. The greatest danger selfies pose may be not to our bodies but rather to our souls, our psyches, our selves. When we make our private moments public, something volatile may occur. Thanks to social media, our selfies become an occasion for a public referendum. Our friends and followers can now vote on our appearance, adding commentary, even forwarding it on to others. Our private moments veer quickly toward public property, fair game for memes and repurposing in a myriad of ways. While it can be gratifying to feel the affirmation of the crowd, it can also be devastating when our posts fail to generate the kinds of attention we seek. When we post a selfie, we put ourselves out there, into the social stream, to sink or swim. We may subject ourselves to far more judgment and cruelty than is healthy or sustainable. We may adapt our identities to conform to the standards already established on social media. While it is great to develop a strong sense of aesthetics (for Instagram) or humor (for Snapchat) or newsworthiness (for Twitter), each of these platforms may limit or box in our developing personas. Where do we find a core identity that is poised to endure the ups and downs of being “hearted” or “unhearted” online? We may turn to social media to bolster our self-image. Selfies are a convenient way to ask, who am I? Yet we need a more reliable source for our confidence and courage than each other. How do we process darker moments of doubt or sorrow or confusion? Where do we post those feelings? I challenge us to lean into the feelings that may lurk behind or beneath our selfies. We may question whether we are smart, pretty, or desirable. We may battle feelings of inadequacy. We’ve all struggled with loneliness and belonging. Researchers have found that perfectionist tendencies of Instagram make it the worst app for young people’s mental health. My hope is that we will turn to God as the source of our self. May we reach back to our genesis, to the radical notion that we are created in the image and likeness of God, the imago Dei. As we rediscover that God (and not we ourselves) made us, we may shift how we see ourselves, how we treat our neighbors, and how we care for creation. We are relational people made in the image of a relational, Triune God. Instead of “taking selfies” in a possessive way, perhaps we can “receive” selfies as a sacred gift from the original Giver. I aspire to perceive and receive selfies as the face of God. Our selfies can be redeemed. May we cast aside our old, manic, false selfies in order to put on a new selfie, in Christ and for the community. This article is adapted from his book Selfies: Searching for the Image of God in a Digital Age (Brazos). Craig Detweiler, PhD, is the President of The Seattle School of Theology & Psychology and the author of the forthcoming book, Selfies: Searching for the Image of God in the Digital Age (Brazos Press).